A couple of weeks ago, I posted a review for Mario & Luigi Paper Jam on this site. Covering pretty much every aspect of the game down to a tee and addressing a dozen problems that the ‘professional’ reviewers couldn’t be bothered to tell anyone about, it’s something I still stand by and heavily recommend read before deciding to buy the game. Yeah, crazy isn’t it? Someone actually looks back on the inside Bowser and Dream World sections of the last two games and desperately wishes they’d have been included in Paper Jam. How is this possible? Well to be honest, because without them, the game feels kind of empty and overly bland. For one thing, not having an alternate type of gameplay/dual world means a lot less gimmicks and interesting overworld ideas, since you’re mostly limited to the same three or four abilities for every section of the game. Hit things with a hammer, drill into the ground/walls, grab things as a stack of characters or fly for a bit as a paper plane. That’s literally 99% of the world exploration in the game, and a lot of the time, it never really feels any more challenging or inventive on the puzzle front. The game pretty much only has half the enemy variety of Dream Team and some of the other past games. And trust me, that’s the nicest estimate. Remember, in Dream Team, all those enemies acted in completely different ways to one another. In this game? A lot of the paper enemies act identically to their non paper counterparts. Oh sure, it’s not an issue in the early game (the paper Goombas and Koopas are arguably the paper enemies most different from their non paper counterparts), but in Neo Bowser Castle? The enemies being made of paper or not is pretty much entirely a visual thing. Broozers and Paper Broozers do absolutely NOTHING different in terms of attack pattern or overworld behaviour, and nor do the Chain Chomps. The end result is that levelling up in the endgame is boring as all hell, since you’ve got a very limited variety of foes to fight and they appear in such low numbers that it takes forever to find a decent fight. Add how the world seems a lot smaller and a lot less interesting due to the lack of two world system and the interplay between them, and you end up with a game that seems to get old a lot quicker than the last two or three games. You can also stack damage/POW boosting cards, which gives you the ability to do things like take off all 4000+ of the final boss’ HP in a single attack. So you don’t get to freeze time or use an instant reset button, but the cards are still about as powerful as the badges in previous games, and can make the game a whole lot more interesting on a tactical level. That’s the whole battle in a nutshell. Dodge, attack, dodge, attack. Repeat ad nauseum. It kind of feels like a fighting game or beat em up from the 80s or 90s, the kind where repeating the same actions over and over equals a win. Above: Not as fun as it looks. To get an S rating, you basically have to never get hit. Ever. The result is a very easy, yet very annoying bonus mode where being plain unlucky can easily mean no S rating that time round. Honestly, it would have been better if they just brought back giant battles again. Yeah, I said it before, and I’ll say it again. The designers of this game really got a bit confused when deciding what qualifies as an attack and what qualifies as a mini game. The result? I also wish there were a few more that target single enemies. Rocket Blast and Drill Shell are the only two I remember, and neither are the most interesting attacks to use or the most fun. Bit of a pain when you’re say, up against King Boo, and you have to take out the smaller Boo without hitting the king in the process. Maybe the next game should simplify Bros Attacks again, and turn them back from quasi mini games into something closer to action commands. But compared to level 100 in the previous games, it’s actually nowhere near as overpowered as you’d think. For one thing, you can’t one hit kill everything in the battle after a first strike, which was mostly possible in the days of Superstar Saga and Partners in Time. 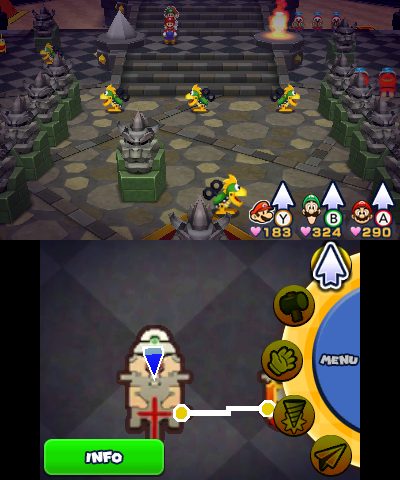 And unlike Bowser’s Inside Story, where level 100 meant you could slaughter your way through the Gauntlet like a robotic killing machine (even Bowser X went down in one turn), this game’s Battle Ring has the last three or four bosses take up to four turns to go down even with some of your best Bros Attacks. It’s even worse when you’re talking about certain boss attacks. 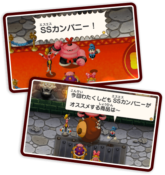 For example, if King Bob-omb explodes, he causes a huge amount of damage to all three characters in your party. Fair enough. King Bob-omb is level 40 in this video (he’s being fought in the Battle Ring). Guess what? His explosion attack manages to KO three characters at level 100, a full 60 levels higher! That’s insane, even for an attack that’s supposed to be a one hit KO/kill in most circumstances. It’s like if a level 40 Electrode exploded in Pokemon Omega Ruby or Alpha Sapphire, and took out your level 100 Arceus in one shot. So yeah, level 100… nowhere near as good as it should be. Yes really. A lot of the above points may have been a bit negative, and some people will likely have gotten the impression that I really, really despise the game or think it’s been designed by a bunch of drunken chimps. Heck, at least one person I spoke to actually said they weren’t going to buy Paper Jam because the problems highlighted in my review were too much of a big deal. But truth be told… it’s not like that. 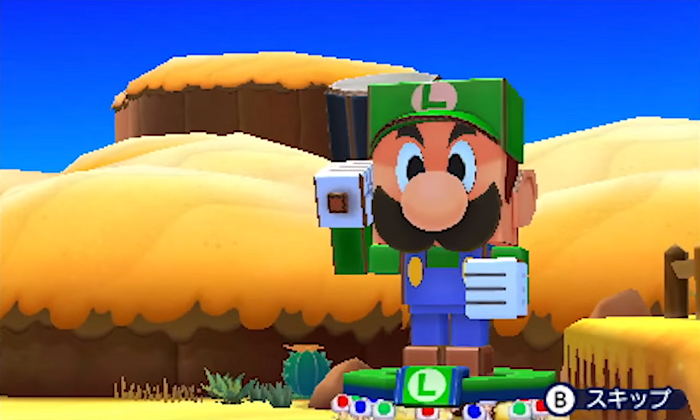 Mario & Luigi Paper Jam is at its heart, a decent game. It’s fun, the battle mechanics are second to none, the humour is still there and it’s got most of the same charm as the rest of its series. It’s just not as good as some of the previous titles, and has some issues that I felt need to be pointed out. It’s not a bad game, give it a chance. 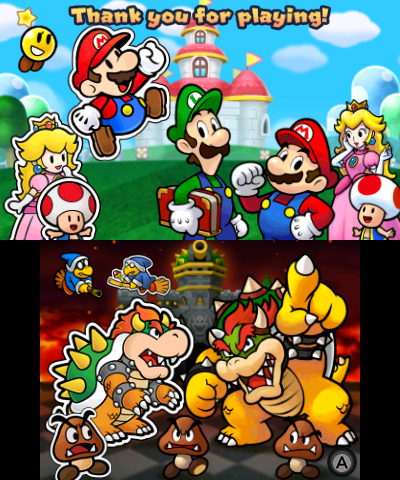 Mario & Luigi Paper Jam; English ‘Miiting’ Is Live!